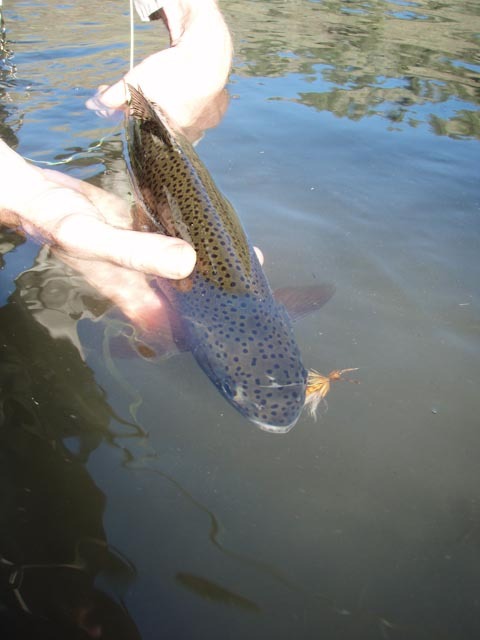 Brian Marz's Fly Fishing Oregon Blog: Deschutes Stonefly Fishing Report - Fresh Hot Off The Press! Deschutes Stonefly Fishing Report - Fresh Hot Off The Press! My good friend Ethan of Ethan Nickel Outfitters just got back from the Deschutes after being there for two consecutive trips. We discussed the fly fishing results of the last two trips and the results we positive. He more or less stressed that the fish are hungry and they are wanting to devour stoneflies. The first trip he was on had slower fishing since the water had taken a bad hit from runoff and the color was off and the flows were high. They did get into a lot of fish, but the second trip had the results that you would want onthe Deschutes during the salmonfly hatch. Lot of big rainbows on dry flies! Deschutes Rainbow Trout - Photo Ryan J. The flies he reported that worked well were the Chubby Chernobyl and the Chubby Chernobyl Norm in the heavy flowing water; while the Norm Woods Special and Clark's Stone were working well in the softer water and more typical spots. Reports of pulling into spots and having clients yarding in lots of big rainbows was the norm for this last outing, and conditions should remain to be similar or even better over the next several days.